Explaining injuries and therapy procedures to patients is always made easier with visual aids. Our anatomical charts and models are excellent ways to show your patients the extent of their injuries and what needs to be done to help them them to recover properly. 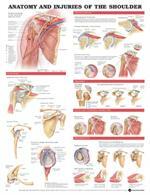 Our anatomical posters allow practitioners to clearly show bone, muscle, and internal organ relationships throughout the body. From head and neck injuries to foot and ankle problems, these anatomical charts will assist your patients in understanding the challenges ahead. Utilize our three-dimensional anatomical models to show your patients a tangible representation of what’s happened to them internally. Choose from detailed models of the hip, shoulder, knee, foot, hand, and vertebral column. You can also opt for a full human skeleton, perfect for teaching anatomical concepts. Whether you’re looking for anatomical charts or anatomical models for your practice, our selection of visual aids will help you provide your patients with the knowledge and understanding they need to facilitate proper recovery.